But there are lots of great ideas for kitchens, kids rooms….brilliant. Today is the Flintstones’ 50th anniversary! Yabba Dabba Doo! And to mark it, Google has them on their front page! Also, The Telegraph has 15 things you don’t know about the show, including the fact the Fred and Wilma were the first couple to be shown in bed together! Daily Mail Online and SPIEGEL ONLINE, they had not. There were a number of reasons why they had stopped, and why they started again, but now it is finally complete. It is interesting to read the Daily Mail’s version of events. 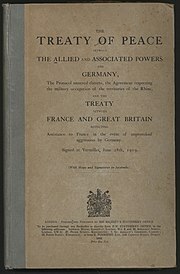 They make the Treaty of Versailles sound like someone everyone agreed to, when in fact it was something the Germans bitterly felt they were forced to sign. It’s also interesting to see them associate ‘quantitative easing’ with Germany’s hyperinflation. That’s ridiculous, since in it’s current use, quantitative easing is being used or considered because the central banks are up against the zero bound and inflation is too low. The central banks are considering it to deal with deflation, not hyperinflation. (Treaty of Versailles image from Wikipedia). Stuxnet appears to be a very sophisticated piece of software that attacks industrial control systems, like those found in nuclear facilities. In particular, Iran’s nuclear facilities. I am always suspicious of IT security stories. There is alot of secrecy and hype associated with them, and then journalists wade in and only acerbate that. It’s entirely possible it was written by some very smart engineer somewhere: indeed, I am more likely to go with that rather than believe it is “cyberwar”. Let’s see how this progresses. The superb blog, Letters of Note, has the story on this letter. I think it reads well without context, but I think you should visit the blog (now and often) to get it. It’s from an animator at Pixar to a young boy who wants to become an animator. But really, with some minor changes, it could be to anyone.